Saturday 9th May, or as I've been calling it, G-Day (Grexit Day) has come and gone, without Churchill's desired invasion of Greece, with the idea of flanking Germany while also limiting the spread of Soviet control across eastern Europe. Now, I wouldn't want you to think that I'm actually comparing the Eurozone to the German occupation of Europe during the Second World War. There is no comparison. One brought pain and suffering across a continent, destroyed peoples, economies, culture, cities, indeed entire countries. And no, don't wait for the punch line - and then there was WWII. The fact is that the European Union with open borders and flow of people and capital has helped to lift millions out of poverty while also ensuring peace across (most of) the continent for over 50 years. It is just a little humorous however to notice that the pre-D-Day map of Occupied Europe does bear a striking resemblance to a present day map of Euro Europe. One of these is the EuroZone, the other is Axis occupied Europe in 1943 - Which is which? Saturday 9th May, or as I've been calling it, G-Day, has come and gone without the invasion of Europe by the New Drachma. Having predicted May 9 as the day, I now say "I was wrong ... about the date." Yet the conditions for a Greek Exit from the Euro are as strong today as they ever were, and getting stronger by the day. In my previous post predicting May 9 as G-Day, I listed six reasons why Grexit is inevitable. The passing of the 9th without a Grexit does not in any way invalidate any of those reasons. Now I'll add another reason; it is the only way that Greece will rebuild the Greek economy and get the country back to work. And until the country gets back to work, there will be no future for Greece. New Zealand almost when broke in 1984, and in the space of 3 - 4 years, after restructuring its economy, went from being the 24th least open economy in the OECD to being the 1st, most open economy. And the economy grew nicely, after weathering the terrible pain of the restructuring. Ireland has stuck with the Troika's demands and programme, and remains in trouble. 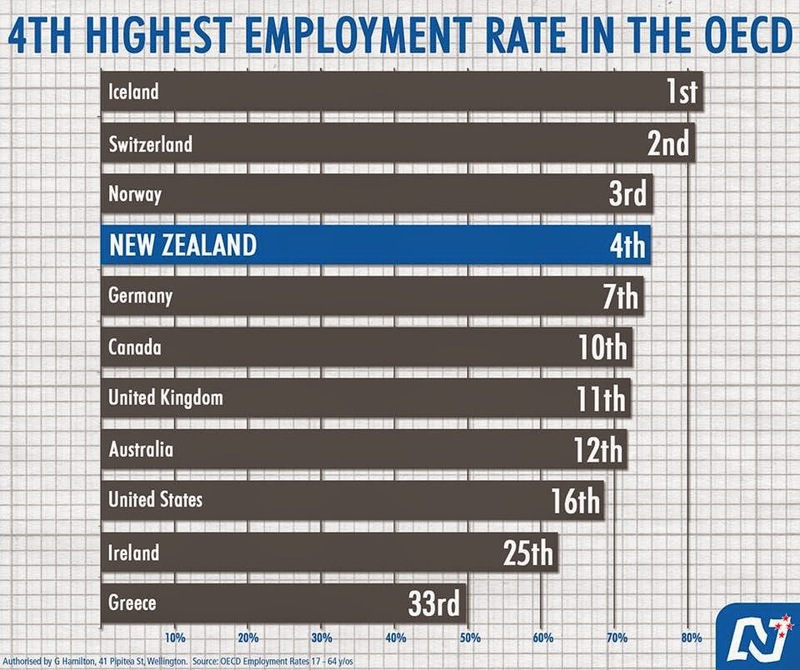 Iceland, after defaulting and being locked out of the international capital markets and the initial pain, has now enjoyed multiple years of solid economic growth, and is now #1 on this chart of levels of employment. Meanwhile Greece is right there at the bottom. It knows that it can follow Ireland and spend another decade handing over assets to the loan sharks, sorry, the Troika and the loan sharks they represent, or it can take the Iceland approach and see renewed economic growth, quickly. The road to growth is through a managed bankruptcy and fresh start. People can do this, and so can companies. As for lending to people, in the United Kingdom the FCA (Financial Conduct Authority) requires lenders to ensure that their clients are actually able to repay, and to ensure that the loan will not result in undue hardship. So why didn't those lending to Greece, or to be more accurate, buying Greek bonds and therefore making an affirmative investment, confirm that their investment would be able to be repaid without undue hardship. This is what the Greek people voted for. The Greek people know that Europe is not going to bail them out, again (and again). Greece (and the Troika) know the debt will never be repaid. Syriza had six months or face political oblivion next election. The Greeks needed to show "good faith" and negotiate, and they've done that. The demand for reparations from Germany is designed to ensure negotiations fail. Number 6 is almost the "General Belgrano" option. If it looks like negotiations will actually happen, thereby stranding your fleet in the middle of a South Atlantic winter, then do something to ensure the other side will not negotiate. Buy your Euros before you leave, because if the Grexit happens while you are there, you'll not be using any ATMs, they'll be shut. You might even get the chance to buy your New Drachmas before you leave. The weather will be sunny. The Retsina will be tasty (and will go perfectly with the sunshine, olives and salads). The Greek people will be as wonderful and hospitable as ever. Because let's be real about this, in or out of the Euro, Greece is a fantastic place, and the tourists will flow in, and the wine and olives and other produce will flow out. And with any luck, and Grexit will also begin the process of (re-)creating a vibrant economy that brings the Greek diaspora home. 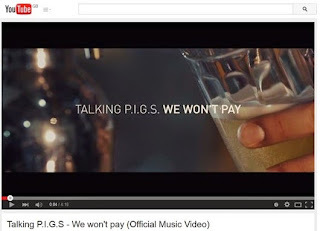 Oh, and for a final treat - the official Talking P.I.G.S. music video! So, it's not just the actions of 1984 (though that was a massive transition for us), it's the ongoing approach and effort as well. I've made this comment before, just as with individuals, families, and corporations, countries have to repay the money they borrow. If they don't then no one else is likely to lend to them. That is the choice Greece faces. Repay or don't. And if they don't, then face the consequences. I couldn't agree more, the NZ experience was one of clearly seeing that the path of pseudo socialism simply did not work, and being highly rationale, it was the incoming Labour government that made the systemic changes that were needed. Greece has a long way to go, and it will be painful. My personal hope is that the past 6 years of austerity and economic stagnation and contraction will have taught a new generation of Greeks the kinds of lessons that the Americans learned through the Great Depression, and that we will see a generation of savers and economic realism. But fundamentally right now Greece's choices are between a couple more years of self-inflicted pain through a Grexit, or another decade of pain, or however long it takes until they Grexit, which is inevitable. Of course, I'm an optimist.